A mining company that extracts oil from coal to produce gasoline, diesel, and other byproducts uses a fleet of trucks to transport coal from the extraction site. The trucks become covered in a fine coal dust and need to be washed regularly. 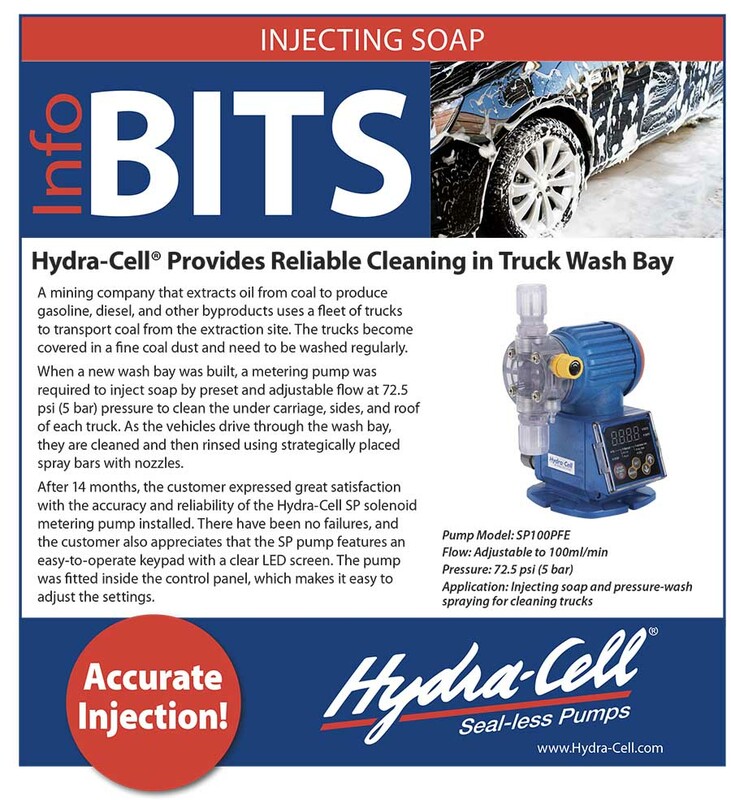 When a new wash bay was built, a metering pump was required to inject soap by preset and adjustable flow at 72.5 psi (5 bar) pressure to clean the under carriage, sides, and roof of each truck. As the vehicles drive through the wash bay, they are cleaned and then rinsed using strategically placed spray bars with nozzles. After 14 months, the customer expressed great satisfaction with the accuracy and reliability of the Hydra-Cell SP solenoid metering pump installed. There have been no failures, and the customer also appreciates that the SP pump features an easy-to-operate keypad with a clear LED screen. The pump was fitted inside the control panel, which makes it easy to adjust the settings.